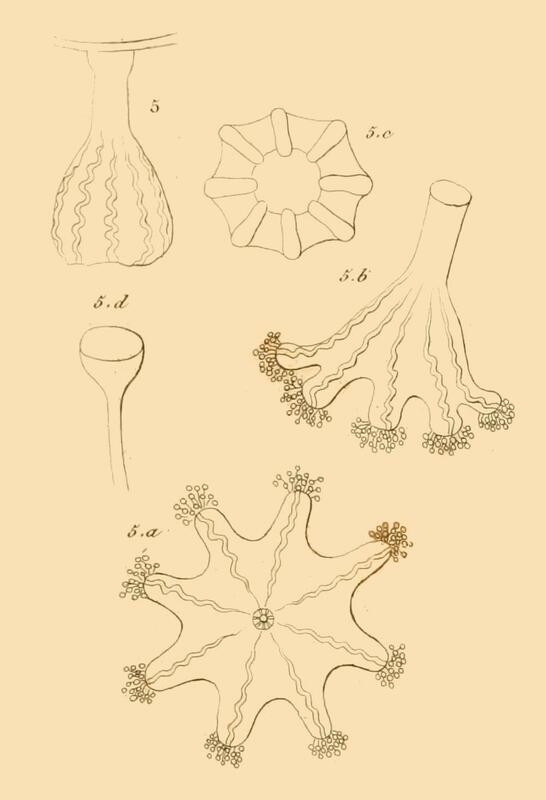 Please note around the mid-19th century, members of the stauromedusae (Stalked jellyfish) were scientifically, commonly and collectively referred to as Lucernaria. Some reported species of Lucernaria may not now be regarded as stauromedusae. Lucernaria nov. sp. 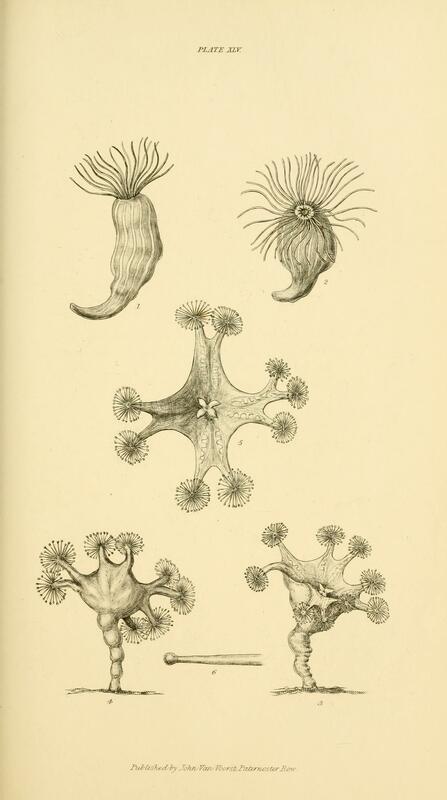 - An article relating to an unidentified species of stalked jellyfish found off Valentia Island, County Kerry, Ireland by W. I. Beaumont in 1896 by David Fenwick. 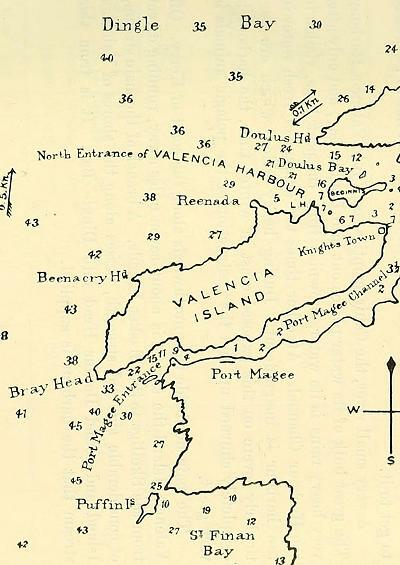 reported Isle of Man sites. David Fenwick. 2014. A search for Depastrum cyathiforme. NOTE on LUCERNARIANS occurring in the neighbourhood of PORT ERIN, ISLE OF MAN. By W. I. Beaumont, EMMANUEL COLLEGE, CAMBRIDGE. 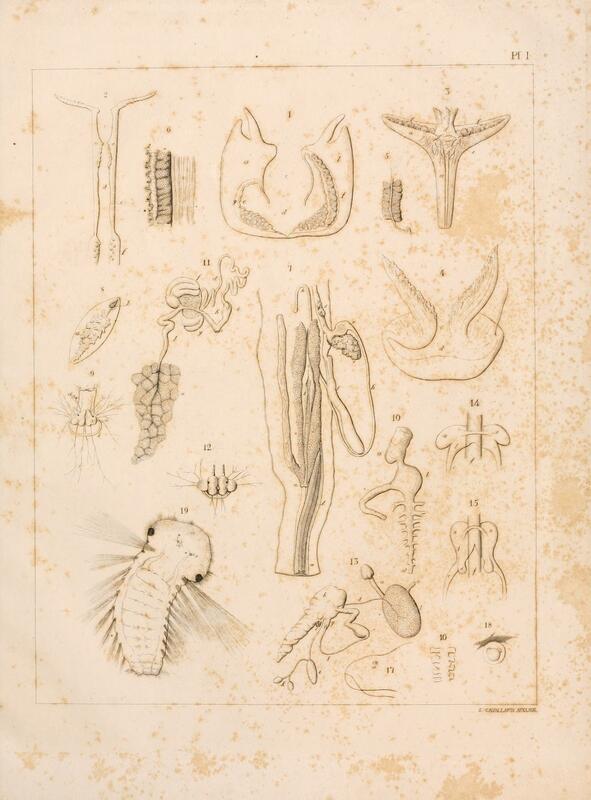 PROCEEDINGS and TRANSACTIONS of the LIVERPOOL BIOLOGICAL SOCIETY VOL. VII., SESSION 1892-93. 1893. p.253. 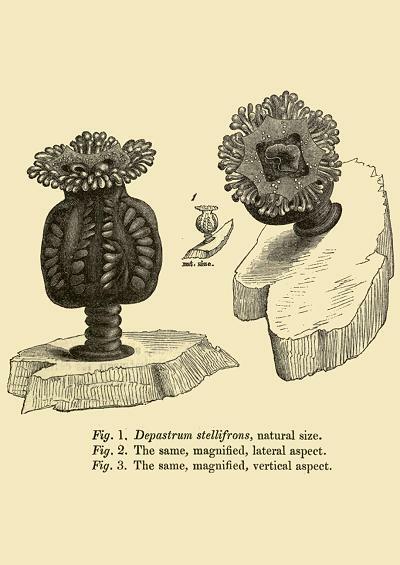 Article describes Depastrum cyathiforme in some detail. 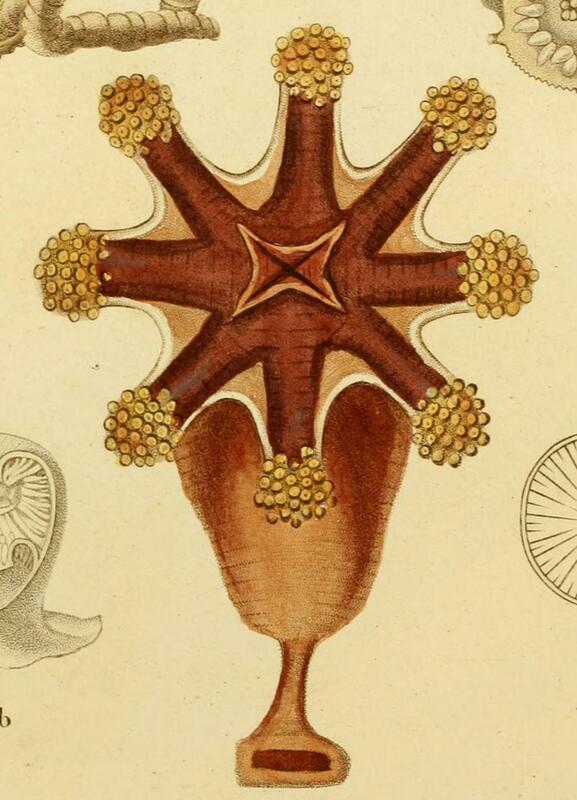 The Trumpet Lucernaria - The Aquarium: Unveiling the wonders of the deep sea by Mr. P. H. Gosse. 1854. 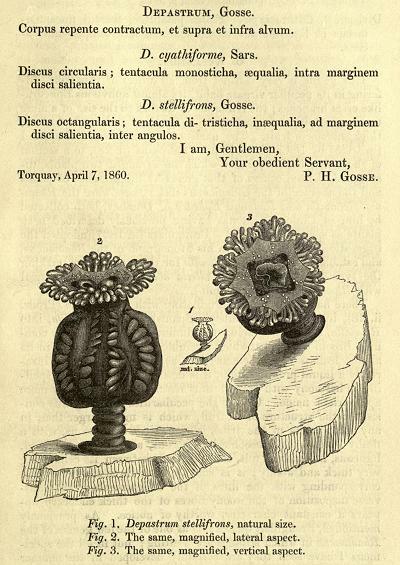 Gosse's account on finding Stalked jellyfish at sites near Weymouth, Dorset. Mag. Nat. Hist. Vol. VIII. Page 59, Fig. 3. 1835. 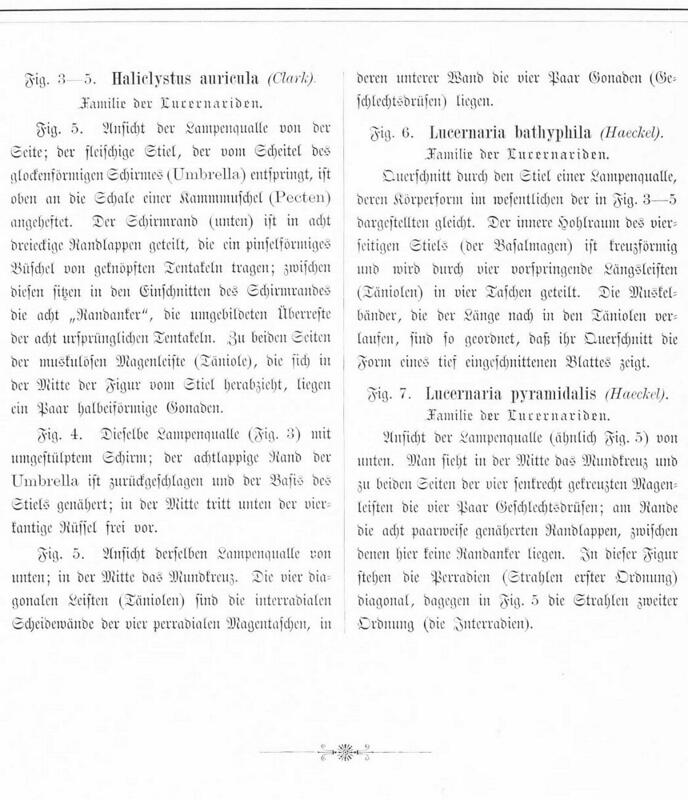 First description for Craterolophus convolvulus. First UK accounts for Depastrum cyathiforme from Arran, Scotland; by Rev. David Landsborough. Ref: Excursions to Arran, Ailsa Craig, and the two Cumbraes, with reference to the Natural History of these islands. 1851. Chapter XXI. Excursions to Arran. p.304. 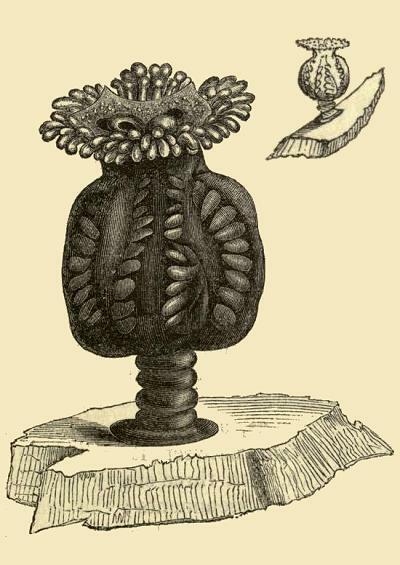 The Goblet Lucernaria - The Aquarium: Unveiling the wonders of the deep sea by Mr. P. H. Gosse. 1854. 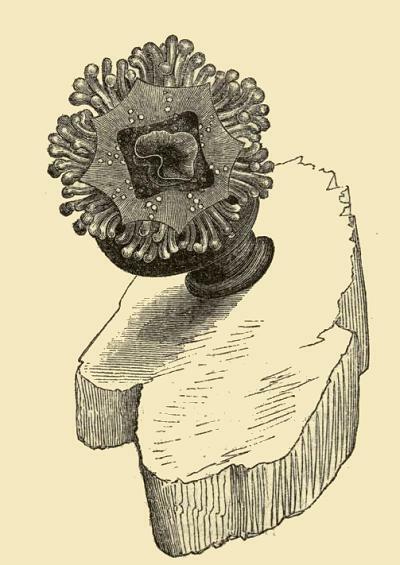 Gosse's account on finding Depastrum cyathiforme at sites close to Weymouth in Dorset. Notes on Depastrum cyathiforme by Gosse. 1860. 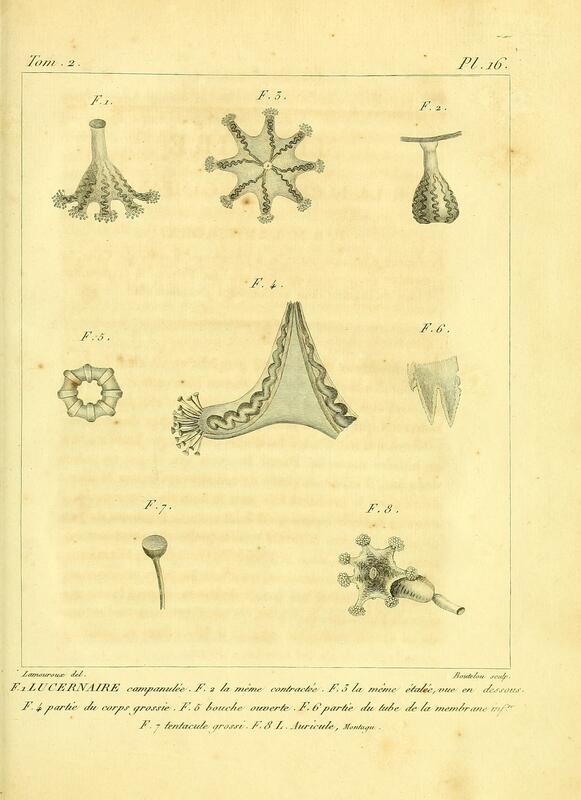 Quarterly Journal of Microscopical Science (including the Transactions of the Microscopical Society of London). No.XXXI, April 1860. p. 125-128. VI. Notes on Depastrum cyathiforme. By G. Y. and A. FRAS. DIXON. Scientific Proceedings Royal Dublin Society. VOL. VIII., PART II. 180-183. Published June 13, 1893. 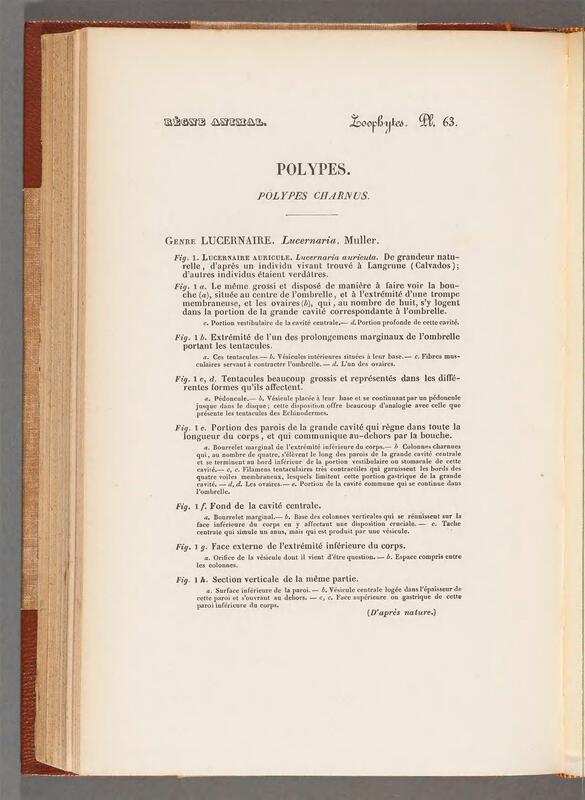 The Annals and Magazine of Natural History including Zoology, Botany and Geology. Volume XIII - Seventh Series. 1904. 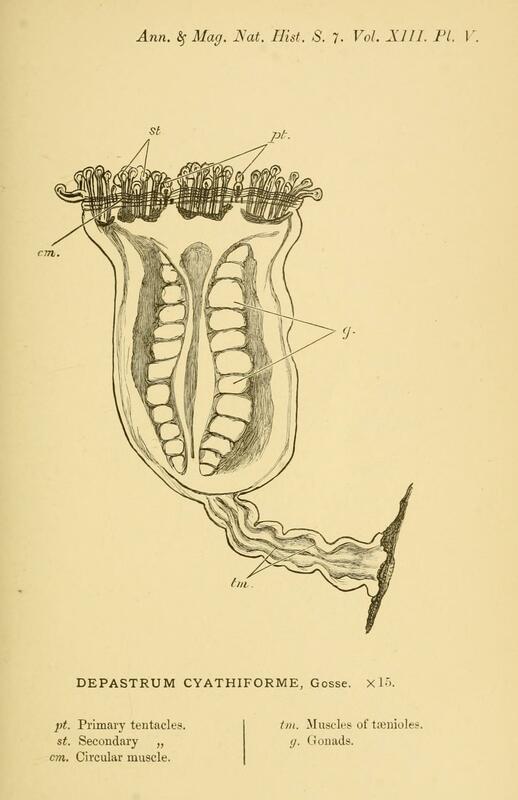 V. Notes on Depastrum cyathiforme, Gosse. By E. S. Russell. Journal of the MBA, Vol. 8, Issue 01, Sept. 1907, pp. 47-48. On Phellia murocincta (Gosse) by Chas. L. Walton. Reference to habitat of Depastrum cyathiforme at Zennor, Cornwall. Includes Lucernaria auricula and Lucernaria octoradiatus. Lucernaria auricula from Salcombe, Devon. Lin. Trans, Vol. IX. Page 113. Plate Tab. 7. fig. 5. 1808. Montagu. Species possibly refers to Haliclystus octoradiatus, see text. 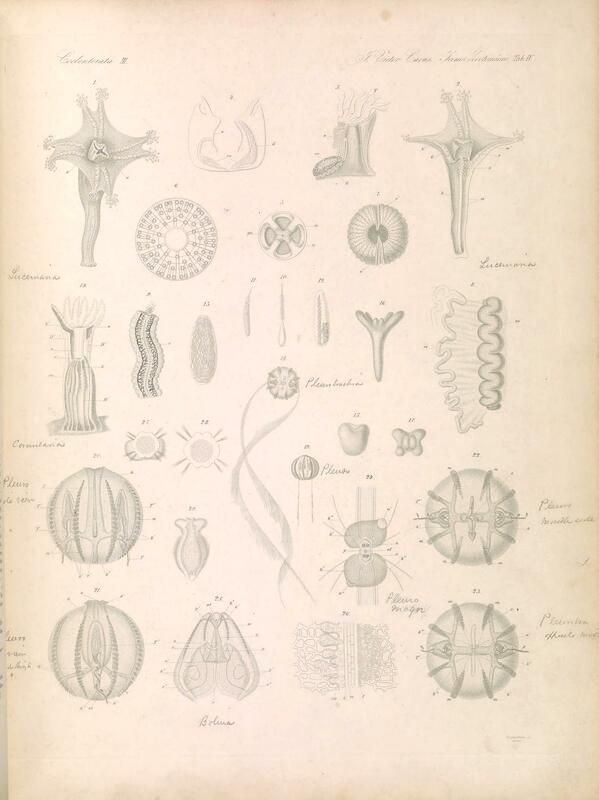 A Cornish Fauna Part III The Zoophytes and Calcareous Corallines by Richard Q. Couch, M.R.C.S.L. 1844. Page 83-4. - A possible reference to Haliclystus auricula as Lucernaria auricula. Haliclystus octoradiatus. 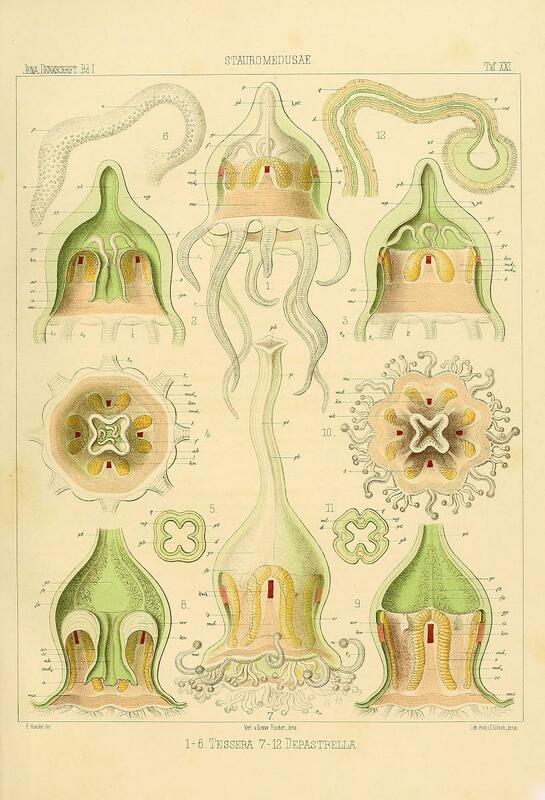 Monographie der Medusen, Ernst Haeckel (1834-1919) from Challenger Expedition 1872-1876 (German text). By the Deep Sea - A Popular Introduction to the Wild Life of the British Shores by Edward Step F.L.S.. 1896. Haliclystus at Scarborough by John Irving, from the The Naturalist 1913. Article refers to Haliclystus octoradiatus. Haliclystus salpinx. Medusae of the World. 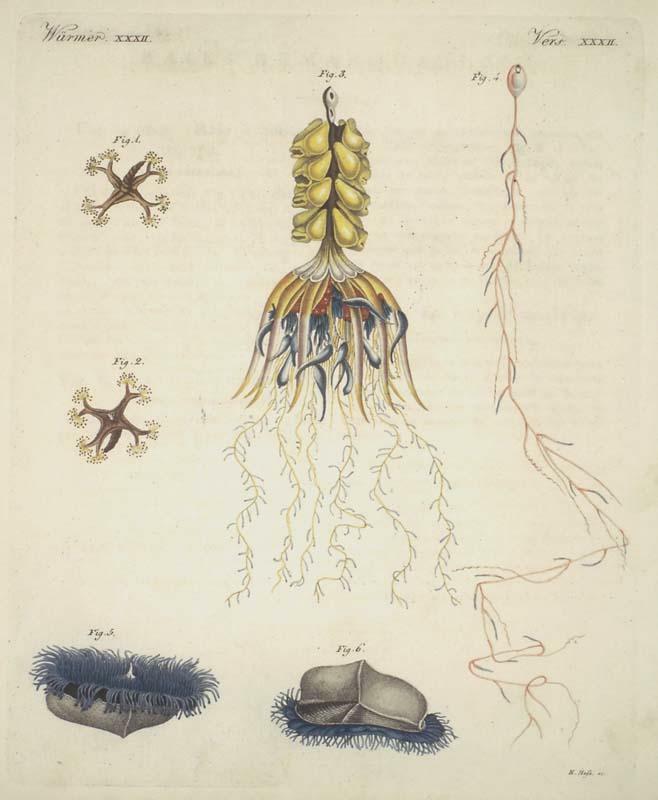 Volume III, The Scyphomedusae. By Alfred Goldsborough Mayer. 1910. 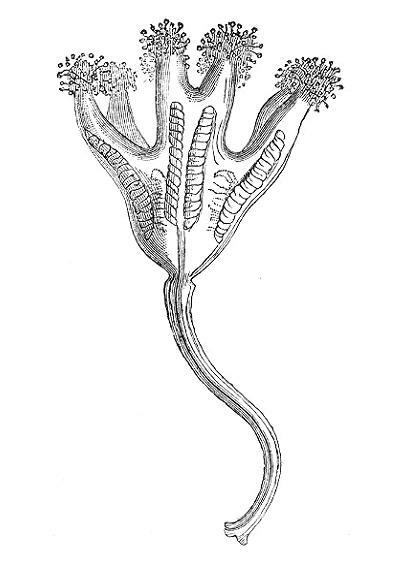 Lucernaria bathyphila Haeckel, 1880 - Monographie der Medusen von Ernst Haeckel. p.640 (German text). Lucernaria fascicularis Fleming. Contributions to the British fauna, by the Rev. John Fleming. Memoirs of the Wernerian Natural History Society. Vol. II, Part.I, p.248-9, Plate 18. Fig. 1 and 2. 1814. Article relates to Lucernaria quadricornis. 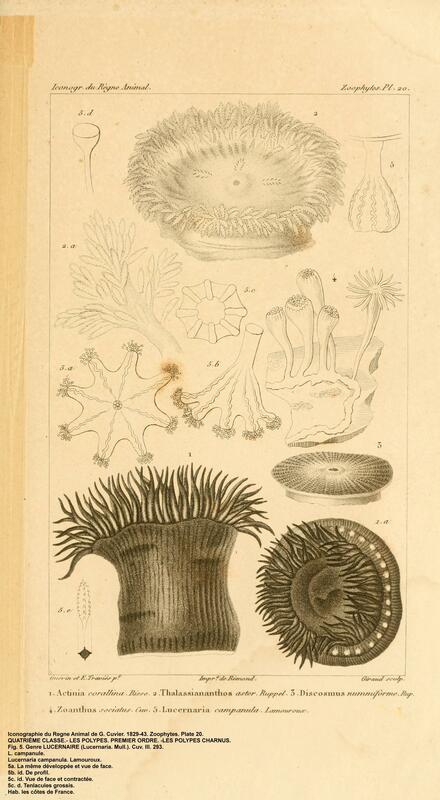 Zoophytes by George Johnston M. D. Edin. 1838. Article relates to Lucernaria quadricornis. Lucernaria fascicularis Fleming. Article by George Johnston. Annals And Magazine of Natural History. Vol. II. 1848. Notes on Luceniaria quadricornis, Muller, and related species. By Richard Elmhirst, F.L.S.. The Annals and Magazine of Natural History. Vol. X -Ninth Series. p.224. 1922. Lucernaria phrygia is not a member of the stauromedusae. Lucernaria phrygia Otto Fabricus from Fauna Groenlandica. 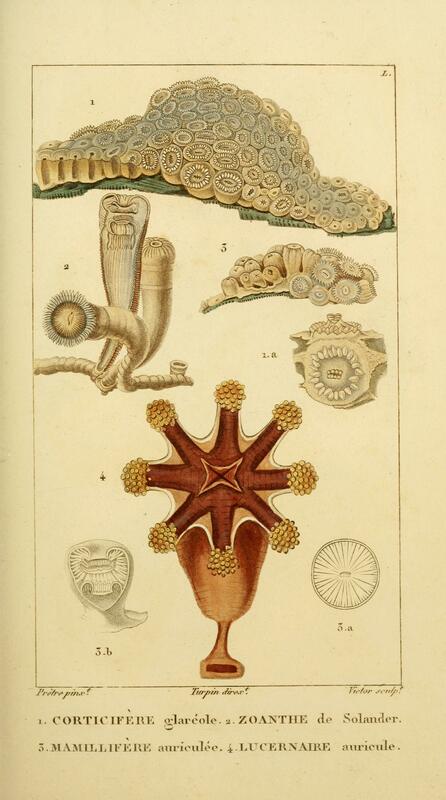 1780. p.343 and Myriothela phrygia Sars, in Fauna Littoralis Norvegiae. Sars. 1877. 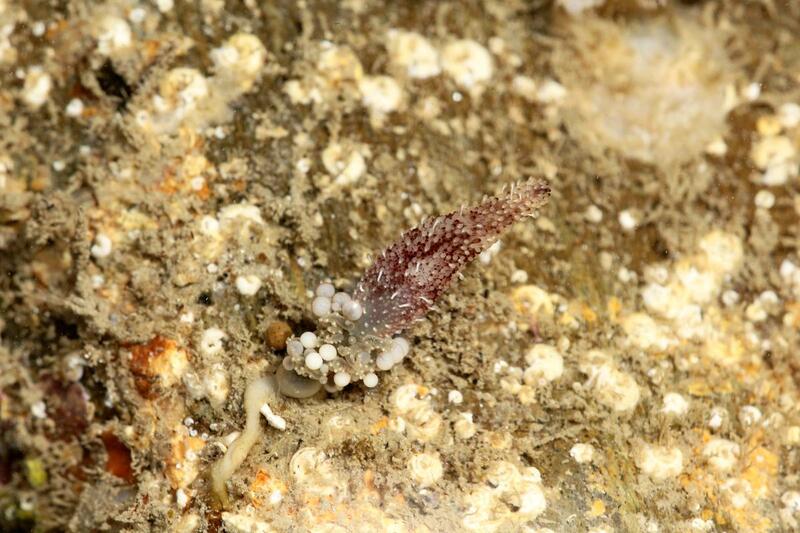 Currently as Candelabrum phrygium (Fabricius, 1780) and is an Anthoathecate hydroid of the family Candelabridae. Candelabrum phrygium has been recorded on shores in the UK, but this species is most likely Candelabrum cocksii as Candelabrum phrygium is a species of deep water. On Lucernaria inauriculata. By Professor Owen, M.D., F.R.S. Report British Association For The Advancement Of Science. 1850. A specimen found at Dover, Kent. Lucernaria at Scarborough by John Irving, from the The Naturalist 1913. Article refers to Calvadosia campanulata. Lucernaria cyathiforme. M. Sars. Fauna Littoralis Norvegiae. Fase. I, p. 26, Taf. III, Fig. 8-13. 1846. 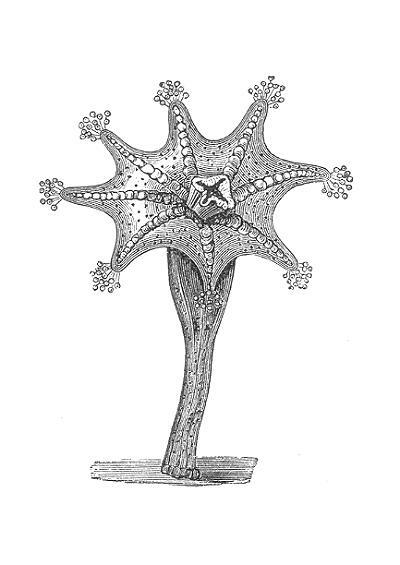 Illustration of Depastrum cyathiforme to the right was found under the synonym of Depastrella carduella Haeckel, 1880; and taken from "DAS SYSTEM DER MEDUSEN. ERSTER THEIL EINER MONOGRAPHIE DER MEDUSEN. 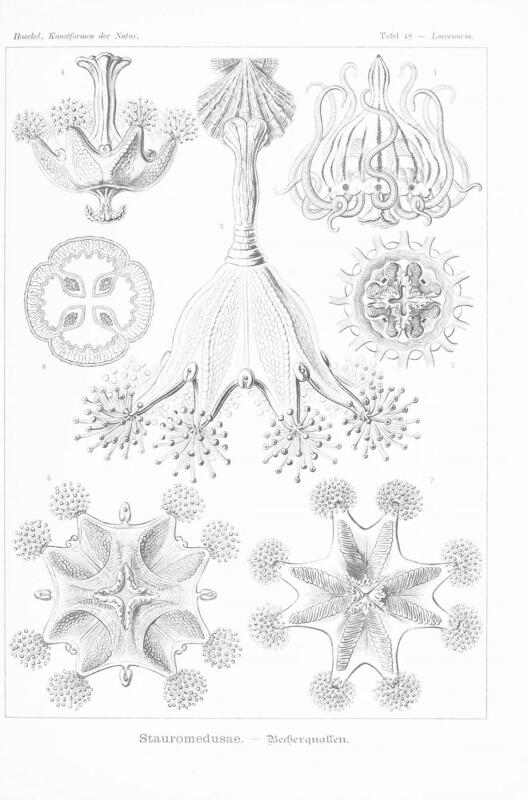 VON DR. ERNST HAECKEL. 1879." Fig. 1. und 2. Die Vierhornige Lucernaria. Würmer. XXXII. Vers. XXXII. Friedrich Justin Bertuch. 1821. 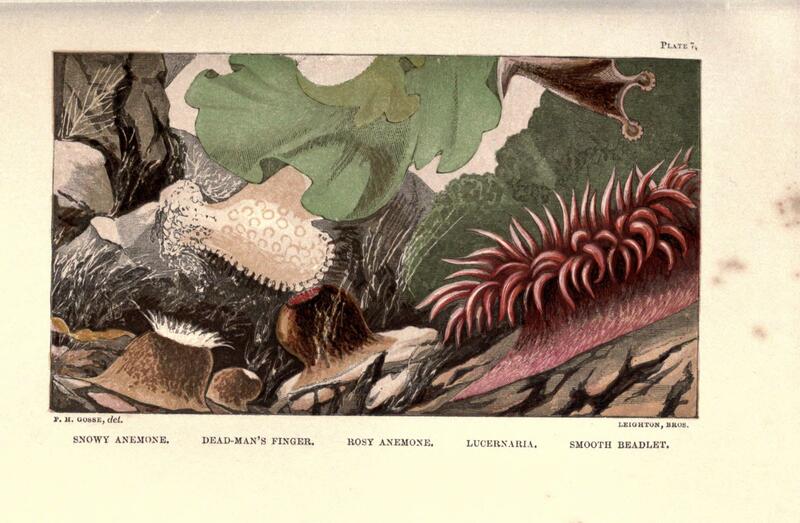 A History of the British Zoophytes. By George Johnston. 1847. Book Two, Plate XLV. Lucernaria fascicularis. Beiträge zur kenntnis wirbelloser theire: mit besondere berücksichtigung der fauna des Norddeutschen meeres. p. 9, and Pl. I, Fig. 3. By Heinrich Frey und Rudolph Leuckart. 1847. Das Leben des Meeres. Dr. Conrad Keller. 1895. 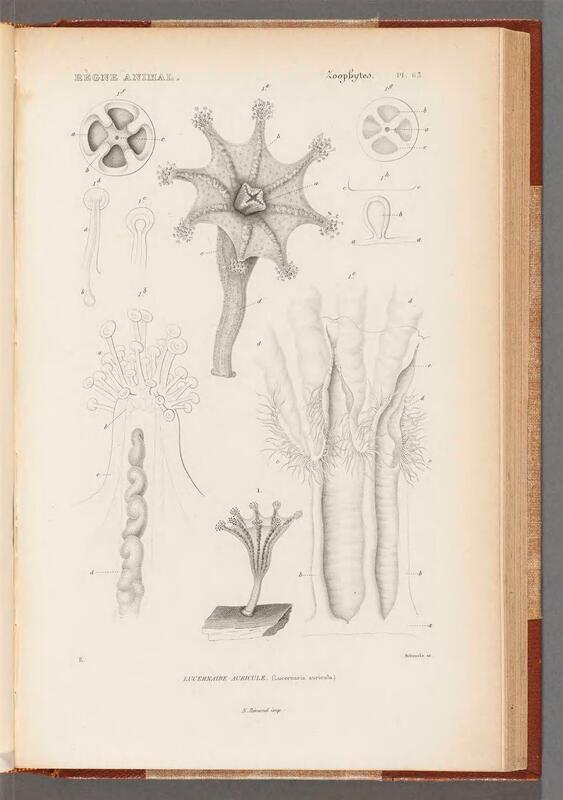 Plate 63 from Les Zoophytes, does not refer to Haliclystus auricula (Lucernaria auricula) as the name suggests, but Calvadosia campanulata; there are no anchors between the arms of the animal featured, and on looking closely papillation can clearly be seen on the specimen in the plate. Dr. Paul Wossidlo. Leitfaden der Zoologie fur hohere Lehranstalten. Siebente Auflage. Weidmannsche Buchhandlung. Berlin. 1896. (Similarly described as Lucernaria auricula and possibly copied from the plate above). As Lucernaria campanulata. Plate 7. A YEAR AT THE SHORE BY PHILIP HENRY GOSSE, F.R.S. 1865. Memoire sur la Lucernaire campanulee par M. Lamouroux. Memoires du Museum d'Histoire Naturelle. Tome Second. 1815. p.460. by Edward T. Browne, B.A., University College, London. Quarterly Journal of Microscopical Science. 1895. s2-38:1-8. Most of the articles displayed here are classed as "public domain", the articles are old enough for copyright not to apply. Much can be gained from historical information, especially habitat and historic distribution; but with advances in science much information will largely be inaccurate. 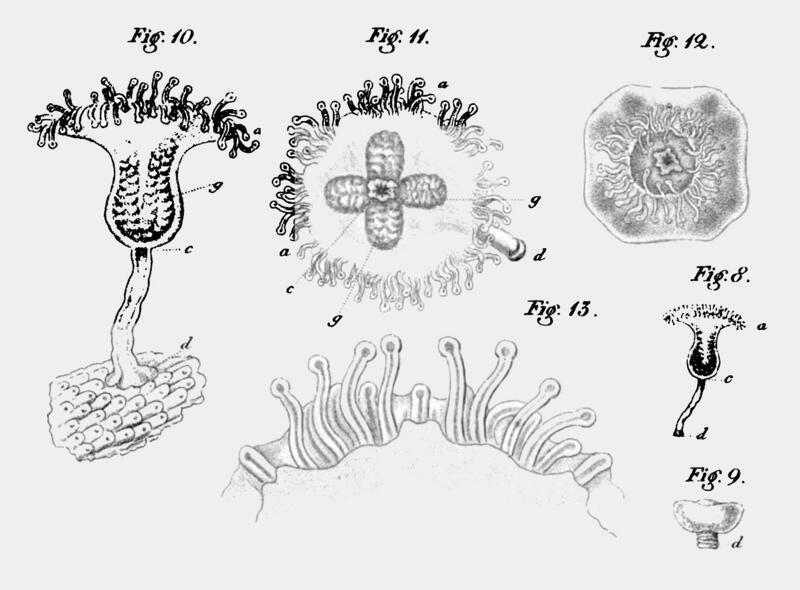 Public domain articles and plates mostly originate from The Biodiversity Heritage Library, Internet Archive and Google Books. I would be pleased to hear from anyone who holds the copyright for more recent articles so that the further information can be provided here.David Fenwick.